I am very happy to report that CNYO has obtained its first official telescope donation. 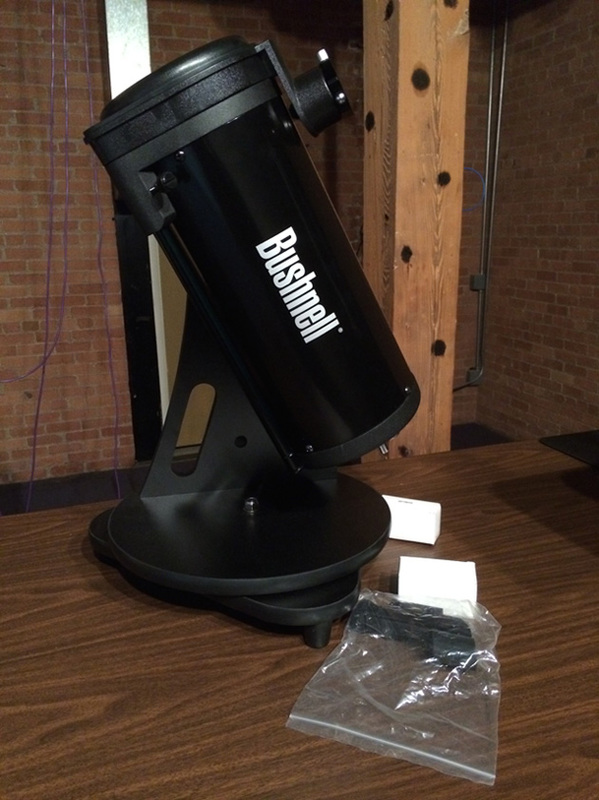 Local amateur astronomer and my favorite Classicist John McMahon has given CNYO a 5″ portable Bushnell Dobsonian made for Optics Planet and awarded to him as a grand prize at the 2012 Summer Seminar held by the Syracuse Astronomical Society. The scope comes to CNYO in great shape and with all the original fixings. Plans for the new McMahon-o-Scope are immediate, as we plan an order of Baader film to make an easily-portable solar scope for upcoming daytime observing sessions. Those of us who’ve been in the community long enough can now marvel at how the Dobsonian design went from custom builders and intrepid amateurs to mass-produced tabletop scopes that collapse down for storage most anywhere. As for the new scope, we await Baader and clear skies. Many thanks to John McMahon for making someone’s future solar setup quick and painless!